In the vast wildlife world of Edward Aldrich, the image of an animal is more than a realistic portrayal; the artist captures the very essence of his subject. Aldrich is dedicated to reaching beyond the rendering of wildlife and the natural world; his belief is that conveying the inherent being of an animal is integral to his art. The viewer is drawn into a scene not to simply look at and appreciate it, but feels he or she has actually witnessed the wonder of wildlife. The artist’s style breaths life into his subjects and conveys a feeling of actually there. Aldrich’s precise brush technique and sense of light and composition place him in the tradition of the past masters of 19th century Britain such as Sir Edwin Henry Landseer. 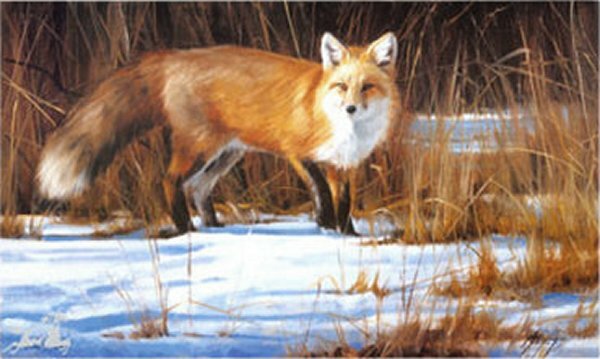 Aldrich graduated from the Rhode Island School of design in 1987 and has enjoyed a very successful career in wildlife painting. He paints in watercolor and in oil and travels the world to view, sketch, and photograph his subjects. The artist paints a broad spectrum of wildlife and its varied habitats, but prefers the cats, North American wildlife, and birds. As an accomplished painter, Aldrich has received numerous awards, and his work has been exhibited in shows throughout the country. In 2000, the artist received the Elliott Lisken Award of Excellence from The Society of Animal Artists. Aldrich participates in annual shows such as "Small Works, Small Wonders” at the National Cowboy and Western Heritage Museum; "Western Visions” at the National Museum of Wildlife Art; the Oil Painters of America Annual National Show; and the "Birds in Art” at the Leigh Yawkey Woodson Museum to name a few. The artist has also had twelve one-man shows in his career. Aldrich’s book, "Drawing and Painting Animals,” features over 100 of his paintings and drawings. In this stunning book, the viewer journeys with the artist deep into the creative process as he shares his thoughts about what goes into his artwork. Aldrich’s outstanding art has been featured in numerous articles in national publications such as Southwest Art, Wildlife Art, American Artist, and others. Edward Aldrich’s dynamic images are exhibited in galleries in the United States and in Canada. The artist and his family reside in Colorado.